Project is a basic element in SentiOne platform. That is why you land in this module right after logging in. If you wish to learn what the internet users are saying, get the AI-based analysis of their statements, ability to respond straight from the tool, or receive the detailed report, you need to first define what exactly you are looking for (as in specific brand, industry, domain, product, or any other topic). The Projects module is where you can create your first project (read here how to do so), manage the existing projects, and navigate to specific Dashboards and Mentions. 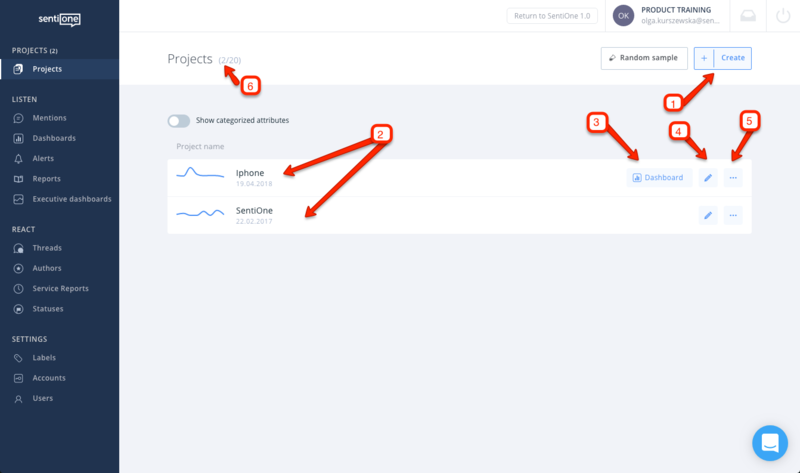 New project – after clicking +Create button, you are moved to the project creator. 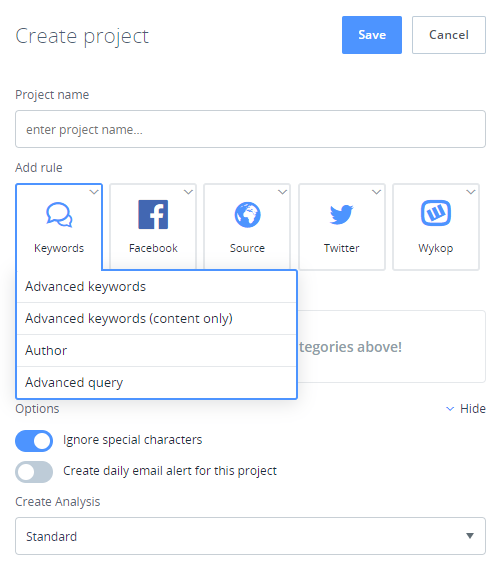 Project’s name – by clicking the project name, you get to the Mentions module with the results for this project. Dashboard – access to the dashboard linked with this particular project. Edit – makes it possible to reconfigure existing project. Other actions – here is where you can: delete, rename, or copy your project (a duplicated project can be edited freely or saved as a new one). Number of created projects against the total number of projects available for the account. Number of projects available for your account equals the number of projects that you bought within your enterprise service agreement or online plan (click here to upgrade if you need more projects). To go to the project creator, you should click on +CREATE in the Projects module. For beginners and those who need fast results, there are three simple scenarios: Brand, Social Profile. (Go to the First project section to learn more). For experienced users and those who need more specific queries, there is the Advanced Project Creator. How does the Advanced Project Creator work? The project set-up should be started with typing its name. The name should concisely define an issue which you want to monitor. Although there's no characters limit for the name, we recommend it should be brief and easily recognisable for team members. When entering the project creator, you can see two windows open by default where you can type in keywords (these are advanced keywords without narrowing to content). However, if you want to use other rules, you should close both windows, then click Keywords and select an appropriate rule. - Advanced keywords (content and context) / Advanced keywords (only content). Apart from the rules above, by clicking on Keywords, you can choose the advanced mode (Advanced rule) described further. – “word1 word2” means that keywords included in quotation marks must appear in content or context in exactly the same form and order (directly next to each other). – “word1 word2”~1 means that keywords must appear in content or context, BUT there can appear maximum one more word between keywords. The number given after a swung dash increases the space between words in quotation marks or changes their order. However, you can always make fewer moves. If we have ~2, we can change the objects’ order without adding a new object or add maximum 2 objects without changing their order. NOTE: in quotation marks, you cannot use signs * and ? Signs * and ? also cannot be used before a word / forms such as *sentione or ?sentione are incorrect. Between separate keywords (included in separate rules) there is a rule OR – it means that in mentions must appear at least one of the keywords which we typed. This type of query works analogously to advanced keywords and searching only in content. Each rule can be added as INCLUDE or EXCLUDE. Keywords added as INCLUDE – this is the basis for the system to collect mentions. Keywords added as EXCLUDE – this is how the system eliminates unwanted mentions. Adding exclusions is possible only after defining minimum 1 rule added as INCLUDE. In order to exclude keywords, you must choose a proper rule by clicking Keywords, and then click on the option INCLUDE set by default – as a result the option INCLUDE will be changed into EXCLUDE. The same steps apply for unwanted fanpages or domains/links. 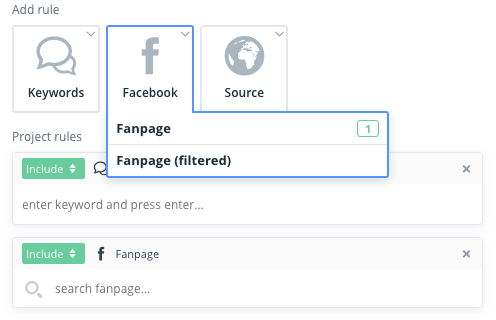 Fanpage – adding a fanpage leads to getting all the content published both by the administrator and users on a given Facebook Page in results (apart from previously defined keywords, collected from all other sources). 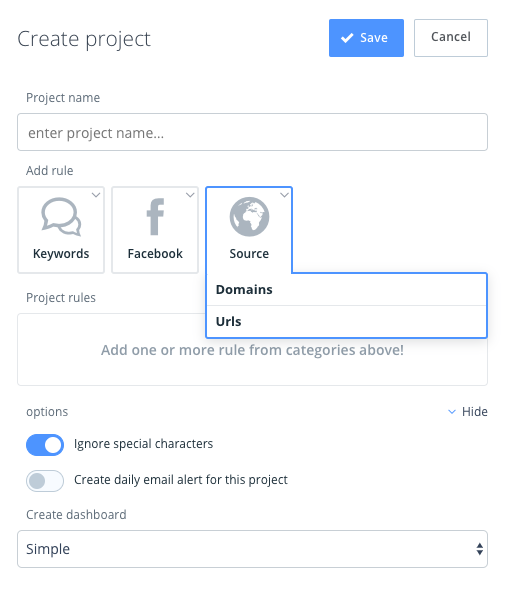 Using the Fanpage rule, you can also set a project in which we will receive all content from a given fanpage (in this case you should choose the Fanpage rule without defining any keywords). Fanpage (filtered) – in this rule, mentions with defined keywords coming from a chosen fanpage appears in the results, next to mentions from other sources. Note: it is worth to add a fanpage (and authorise it if possible) because the system will treat it as a priority and so, the mentions will be collected faster (otherwise, the system collects mentions from more popular sources first). Domains – the rule allows you to narrow mentions to a particular domain. You can use it to either include or exclude a particular website from the search. The domain rule does not require defining keywords – by defining only a domain you will receive all mentions from a particular source, regardless of their content. URLs – the rule works analogously to the domain rule, allowing to narrow mentions to a particular link (this could be, for example, a thread on a forum). Language – this rule allows you to filter mentions by languages available for your SentiOne account (set for each enterprise account individually or chosen in the sign-up form for online users - write to contact@sentione.com in case you wish to monitor more languages). Ignore special characters in the keywords. Set email alert to a given project. How does “Advanced query” rule work? Advanced Query can be really useful when you wish to create more sophisticated projects (therefore, get more precise results). This way you can for example find relevant sales leads or monitor specific types of mentions from Facebook (like posts, comments or private messages) filtered by keywords, or decide if you want the system to collect articles or not. Please note, that it is not possible to combine the set-up of basic and advanced modes. So if you choose these rules and put a query there, then other preconfigured rules won’t work.